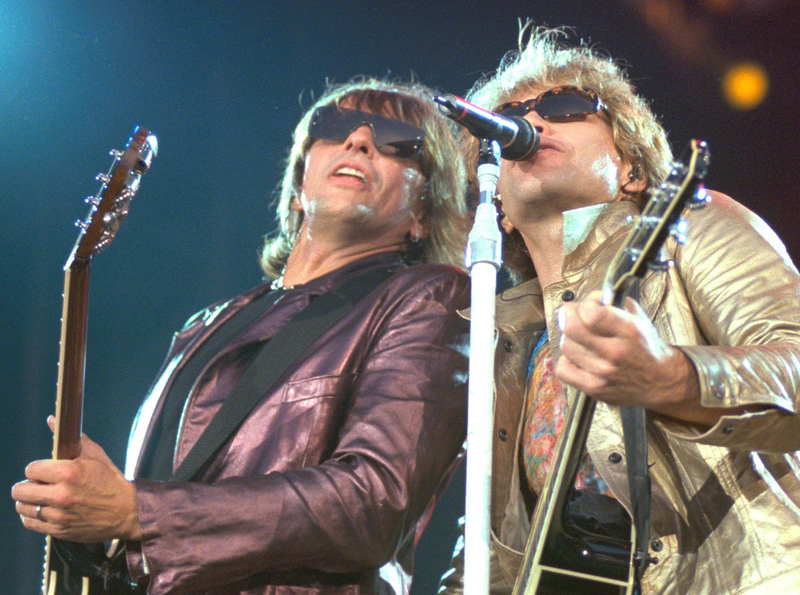 Jon Bon Jovi and Richie Sambora at The Britannia Stadium in August 2000. While thirty-odd thousand people were enjoying Toploader’s first song, yours truly was waiting patiently back-stage. I was watching Richie Sambora, who had arrived only minutes earlier in a blacked-out V-reg Mercedes, meeting members of the Bon Jovi fan club. “Sure, man,” the big guy responded in a kind of Joey-from-Friends accent, shaking the fella’s hand and squeezing past the mean-looking guards in yellow T-shirts. Seconds later, I too was whisked through the kind of security I imagine surrounds the SAS head-quarters in Hereford for a face to face interview with Jovi’s lead guitarist. Wearing a white T-shirt, brown combat trousers and boots, he stood up as I entered the tiny hospitality suite and extended his hand. At this point, my worst fear was that I was about to discover that one of my idols was a self-obsessed idiot with an ego bigger than his bank balance. But, though tall and tanned like you’d expect for a multi-millionaire musician, Richie Sambora was, mercifully, a hell of a nice guy. Down-to-earth, attentive, and witty – he made the interview a breeze and went out of his way to ensure I was given enough time as a frantic American PR woman hovered over us. No, he doesn’t get nervous before gigs, he assured me. Neither does he or any of the band drink before or during a show. “Not like the good old days man,” he smiles, sipping a pint of what looked distinctly like lager. Gone are the girls, girls, girls, days of the Slippery and New Jersey tours. “Most of us are married now and Jon and Dave have kids,” explains Richie. “Hell, we had a great time before Aids and all those social ills. Then you get money, of course, and you realise you can get sued,” he laughs. The Crush tour differs from previous monstrous Bon Jovi journeys because it is paced differently, accord-ing to Richie. “We leave more time free these days to keep our own sanity,” he says. So is he amazed the band is still filling stadiums across the globe 14 years after the album that first rocketed them to stardom? “Sure,” he says. “Every day. But then I look back at the amount of touring we’ve done and what goes into making our records and I can understand it a little better. So why is it that Bon Jovi are still together making records when so many of their peers have gone to the wall? “Oh man,” he says. “If I had the answer to that one then you and I could bottle it and sell it and we’d make a million dollars. I do think, however, that it has something to do with where we came from, where we grew up. Richie then went on to say that he thought the band would be back in the UK on tour again next year. At that point frantic American PR woman insists my time is up. “You coming up to the bar?” says Richie, referring to the on-stage bar for VIP guests. “Am I?” I ask PR woman. Moments later and Jon Bon Jovi was climbing on to the aforementioned bar mid-way through One Wild Night and giving me a high-five. Of course, the concert cameras zoomed in on the action and for the 60 seconds JBJ was up there my pasty, ecstatic face was plastered all over the giant TV screen. Needless to say I was on a high when I melted back into the crowd 15 minutes later. The boys were at their brash, polished best last night. Launching straight into Livin’ On A Prayer and You Give Love A Bad Name. Nothing like starting as you mean to go on is there? The set was a mixture of old and new. An irresistible cocktail of Jovi anthems and ballads, spiced up with enough material from the new album to keep it fresh and exciting. Who am I trying to kid? They could have got up there and played Twinkle, Twinkle, Little Star and I’d have hailed it a masterpiece. In my opinion Bon Jovi are one of the world’s top acts. They can play and sing live with the best of ’em. And they give two-and-a-half hours of sheer value for money. You can’t help but marvel at Richie’s mastery of whichever guitar he picks up. Keyboardist David Bryan and drummer Tico Torres are the background troopers who never put a foot wrong. And then there’s Jon. He only has to curl his lip and the crowd goes nuts. Covering more ground than a Premiership referee and sweating like a stuck pig, he always delivers the goods. And by the way – have you noticed how he never ages? Bon Jovi were superb last night. How do I know? Because a colleague who shall remain nameless went to the show with the serious intention of hating every last minute of it. That’s why if you look up the dictionary definition of smug today, you’ll find my name next to it. And so, Jon Bon Jovi and his cohorts continue to fill stadiums the world over – much to the annoyance of trendies who wouldn’t know a good band if they fell over one. Last night’s gig at the Britannia was my 15th Bon Jovi concert – made all the more special because my wife was in the audience for the first time. Not because she was a fan you understand – until last night that is. To see them in my home town was great but more importantly, surely a portent of things to come. You see, it’s one thing for us to host whimsical events such as the Summer In The City with all their teeny-bopper appeal, but attracting the likes of Bon Jovi to the Potteries is undoubtedly a coup which should put the stadium on the touring map for top bands who play live rather than mime through their sets. Bon Jovi are far from everyone’s cup of char. But like ’em or loathe ’em, they’re a quality act with 16 years of touring and album sales in excess of 60 million under their belts. And anyone who thinks they simply faded away and took their bad haircuts with them after the success of Slippery When Wet needs to wake up and smell the coffee. For while fine bands like Guns ‘n’ Roses were pressing the self-destruct button in the early 90s, the four original members of the New Jersey Syndicate have continued to reinvent themselves and still manage to cling on to and even broaden their fan base. A mickey-taking colleague told me the other day that he had heard metal was making a comeback. I just smiled ruefully, because Jovi fans like myself know it never really went away.